Sulgrave’s community shop is a “not for profit” venture, staffed largely by volunteers, with the aim of providing for both daily requirements and a range of special items more usually found in a delicatessen. Wherever possible, locally produced items are favoured. The Post Office is housed within the shop and from Tuesdays to Fridays provides a range of services including banking and cash withdrawal facilities for customers of the Alliance and Leicester, Barclays, Co-operative Bank and Lloyds TSB. In addition, standard tariff postage stamps are available during the normal opening hours of the shop. See here for maps showing the location of the shop. What do we sell at the shop? Approximately 1500 items are currently on the stock list and these include tinned, jarred and dried goods, household consumables and basic medical items, dairy, chilled and frozen products including an assortment of ready-meals, a delicatessen section, a wide variety of breads, cakes and biscuits, a carefully selected range of wines with individually labelled tasting notes, beers, ciders, spirits, a selection of soft drinks, fresh fruit and vegetables, stationery and greetings cards, newspapers and tobacco products. The shop is also an agent for a dry-cleaning company so clothes can be deposited and collected at the premises. The Shop sells bread baked by a local bakery, purchases vegetables from a local supplier and sells bottled organic apple juice and cider vinegar made from apples grown in a local orchard. Village residents with fruit trees in their gardens are invited to offer the shop any surplus fruit such as cooking apples or plums. The Shop also stocks a range of specialist spice-mixes (harissa, tagine and lemon paste) produced commercially by one of the village residents. The Shop has a coffee machine (which can also make tea, hot chocolate and soup). Reusable cups are available and a discount on a cup of coffee is offered for customers who use these or bring their own cups. A range of pastries is on offer and fresh sandwiches are available from the chiller. Sausage rolls and pasties are baked every day and, at weekends, freshly-baked croissants and pains-au-chocolat are on sale. Freshly baked croissants and pains au chocolat available on Saturday and Sunday mornings. Over the last fourteen years, Sulgrave Village Shop and Post Office has become established as the beating heart of Sulgrave Village. The success of the shop, which came into being in 2004 in response to the need, expressed by many residents, for a local shopping and post office facility, has exceeded all expectations and the local population cannot imagine what life would be like without it. As well as providing a much needed retail outlet, the shop has developed into a social hub for the village and many residents call in as much for a chat and to catch up on gossip as they do to stock up on groceries. The shop is a community project run largely by volunteers on a not-for-profit basis. As well as serving the residents of Sulgrave, it draws customers from many surrounding villages and, as its fame spreads, attracts shoppers from an ever increasing catchment in addition to pulling in lots of passing trade. Sited in the old village reading room, the shop is tiny but customers often liken it to Dr Who’s Tardis and are amazed at the range of products available. In addition to all the basics, the shop has a delicatessen, sells fresh fruit and vegetables, locally produced free range eggs, freshly baked bread, pasties and sausage rolls and stocks chilled food and drinks, frozen ready-meals, a carefully chosen wine selection, newspapers and many, many other items. Freshly brewed coffee and other hot drinks are available and, at weekends, the aromas of hot croissants and pains-au-chocolat prove irresistible to passers’by. The Post Office has proved a godsend to residents (especially the older members of the community) who can now draw cash and receive their pensions without having to travel to Banbury or Brackley. The shop is a brilliant example of what a community can do if it puts its mind to it. The management committee, all of whom are volunteers, put in a huge amount of effort to ensure that everything operates smoothly and the volunteers themselves contribute an estimated 90 hours of their time each week. Two part-time shop supervisors oversee management of stock, handle many of the back office tasks and superintend front-of-house shop and post office duties but all other input is down to volunteers. 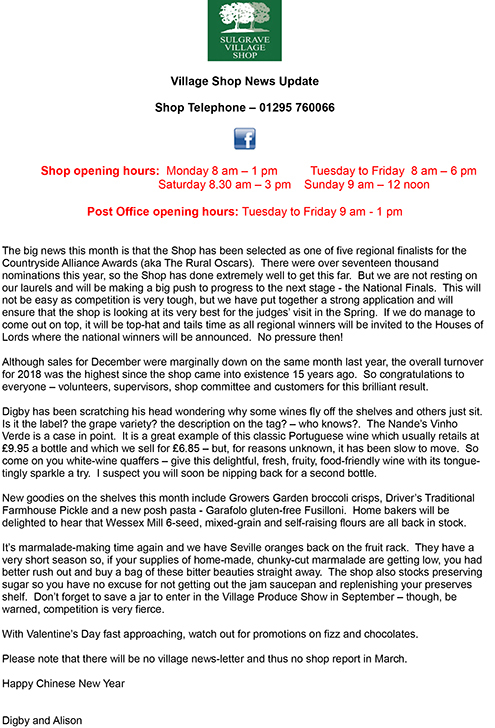 With trade increasing year on year, Sulgrave Village Shop is bucking the trend in declining sales seen in many retail outlets and there is little doubt that it will continue to provide an invaluable service, both practical and social, for many years to come. I cycle up to Sulgrave shop regularly from Marston St Lawrence although at the moment I am so unfit that I have to walk up the hill! I always receive a friendly welcome from David and all the volunteer staff. Unless the weather prevents me I do most of my food shopping there- my family particularly like the bread and the Tropicana orange juice and I even buy the delicious Belvoir elderflower presse for friends and neighbours. On Tuesday I obtained everything on my shopping list and more stuffing my bicycle panniers with numerous bottles and packets – it is much easier on the back than carrying it from the supermarket to the car. The shop provides a marvellous service to the community but will only be able to continue if it is well supported. I’m a volunteer worker at the shop and like many others I give my time freely to ensure that our village continues to enjoy the benefits of shopping close to home. However, it is very nice indeed to read comments such as Clare’s and may she long continue to cycle up that steep hill to do her daily shopping. I’m a volunteer worker and couldn’t agree more with Clare’s remarks. We do, indeed, provide an essential service, and more, particularly as, with an ageing population we are able to offer personal deliveries to those unable to get to the shop themselves – we are also a central meeting place for those who live alone and need company from time to time.